I've added two new products to my beauty regime, the nourishing shampoo from Naturaltech Davines series and the apricot scrub from Ole Henriksen. Unlike many others, I'm not a fan of the scrub - it's very coarse and rough on the skin, and I wouldn't say my complexion has benefitted from using it. Next time I'll definitely choose a product with smaller granules - a good facial scrub is essential! The Davines shampoo works really well on my dry brittle hair and sensitive scalp. Since I use a lot of product I also like that my hair gets really clean, it doesn't just smell great! 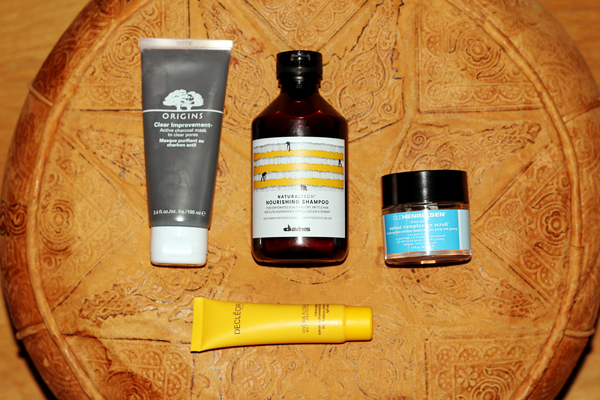 Other products I'm addicted to is the Clear Improvement clay mask from Origins and Declèor Hydra-floral daycream.